Laurel Highland Farm's Imported 1993 Fell Pony Stallion "Waverhead Robbie"
Laurel Highland Farm is proud to provide a home to one of the largest herds of Fell ponies outside of their native Cumbria. This includes several imported and licensed Fell stallions, exceptional quality mares, as well as our homebred youngstock. Laurel Highland Fell ponies have found wonderful homes coast-to-coast, including California, Washington, Arizona, Texas, Maryland, Minnesota, Pennsylvania, Wisconsin, Michigan, Vermont, Massachusetts, Florida, Connecticut, North Carolina, New York, New Jersey, Tennessee, Missouri, Virginia, New Hampshire, Nebraska, and more. Our ponies have also been exported to Canada, Mexico, and back to England as well! In addition, our stallions have sired foals throughout North America, as well as in England and Belgium. When we started breeding Fell ponies there were only about 20 in North America! Over the years, we have bred more than 120 beautiful Fell ponies bearing the "Laurelhighland" prefix. Nonetheless, with still only about 450 Fell ponies living on this continent, many of which we have owned or bred, Fells remain quite rare, just as they are in their homeland. A native breed from England, the Fell pony is probably one of their best-kept secrets! The Fell pony is a versatile, sure-footed, larger- type pony that stands at less than 14 hands and is used for riding, driving and jumping by both children and adults alike. The Fell is also well known for its stamina and wonderful temperament. All of these traits have contributed to its frequent use in the UK by their Handicapped Riders' Association. 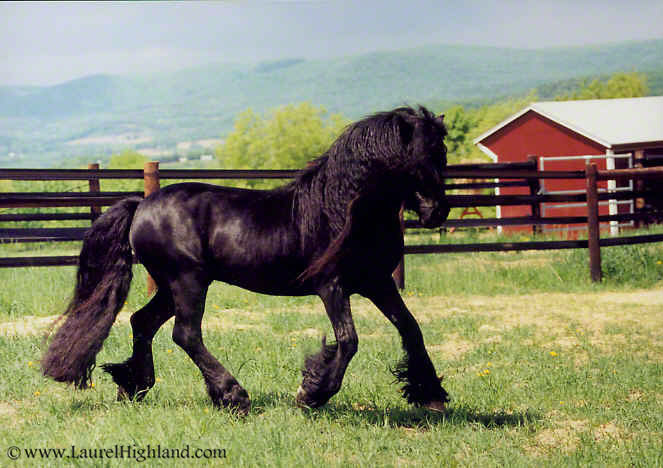 The Fell is usually black with a long mane and tail, luxurious "feather", and well-balanced knee and hock action. This may sound like the description of a Friesian , but there is a big difference -- about two to three hands! Seriously, aside from general similarities to the Friesian, the Fell is a unique and wonderful pony breed. In many ways, despite being smaller it is superior to the Friesian - most notably because of its natural stamina which Friesians typically lack! Indeed, it comes as no surprise to Fell enthusiasts that the Duke of Edinburgh, despite having his pick of all the many other native pony breeds, drives Her Majesty's team of Fells regularly in combined driving competition. HM the Queen is also the patron of the Fell Pony Society in the UK. Centuries ago, the vast majority of Fells were also black or dark-colored. But during their history, the grey color was introduced, mainly because the monks who rode them preferred white ponies! Today, Fell ponies are predominantly black, although other solid colors are allowed. A small star is not uncommon, and a little white on or below the hind fetlock, although less common, is also permitted. The similarities between the Friesians and Fells are more than coincidence. Back in Roman times, Emperor Hadrian decreed that a wall should be built, stretching across what is now roughly the border between England and Scotland. This is in the vicinity of what is now Cumbria, where the "hills" are also called "fells". Stallions were brought there by Friesian mercenaries in the Roman army during the construction of Hadrian's Wall, and this is the basis for a popular theory about the origin of the Fell pony -- i.e., that the "breed originated by crossing Friesian stallions with native ponies at Hadrian's Wall." However, based on very recent research, this explanation for the origin of the Fell pony is surely a myth. In fact, there are fossils resembling the Fell pony in England dating back to 60,000 B.C. -- long before the Romans ever invaded British shores. The Fell pony is perhaps the most similar living prototype of its prehistoric ancestor - the so-called "Forest Horse", which should really have been called a "pony" based on fossil evidence. This "Forest pony", which might well be considered the "father" of many draft-type breeds, was probably dark-colored and had broad feet, heavy bone, feather and long manes and tails. Long before Roman times, this type was common not only in England but also in France, which were connected by a land bridge before the English Channel formed, as well as in the "Low Countries" (Netherlands). In fact, the fossils at the Roman Wall of the "Forest" type are nearly identical in size with the Fell pony, not the Friesian! Thus, this common prehistoric ancestor -- the Forest "pony" -- is the most likely explanation for the resemblances between the modern Fell pony, the Friesian horse and others, including the Merens pony from France and other breeds in Scandinavia. For more information, see the upcoming book, The Fell Pony Family Album. 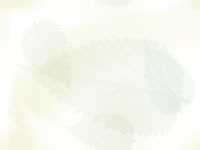 As North Americans begin to discover this delightful and versatile breed, Fells are quickly becoming very popular here. Over many years, we have gradually built our herd by carefully selecting only the best quality foundation breeding stock -- not only for the foals we produce but also for the future of the breed in North America. We hope you will join us in helping to promote and preserve this rare treasure!